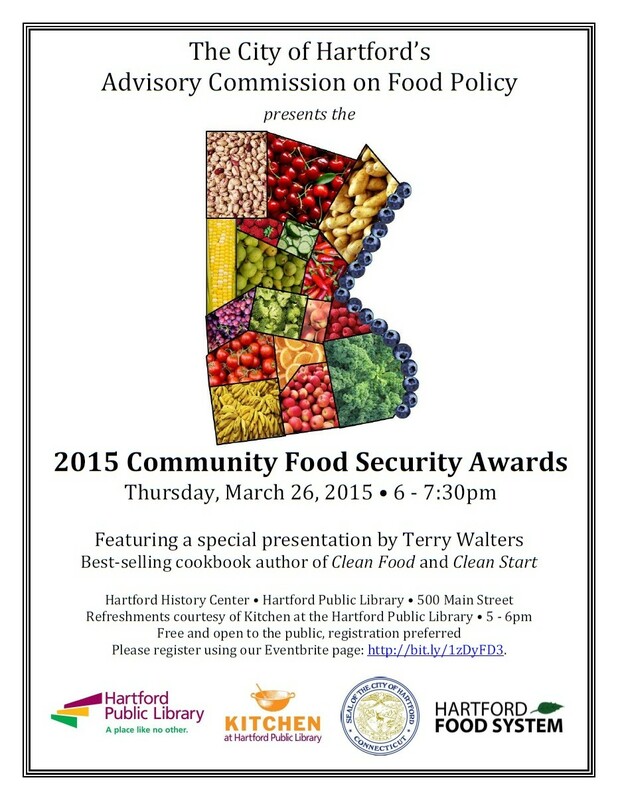 The 2015 Hartford Community Food Security Awards are coming up on Thursday, March 26 at the Hartford Public Library! Come and be our guests in celebrating this year’s nominees and winners works and achievements in strengthening Hartford’s food system! For more information and to RSVP, click here. We hope to see you there! What are the Food Security Awards? Hartford’s Advisory Commission on Food Policy regularly hosts the Community Food Security Awards event to raise awareness about community food security and to recognize individuals and organizations in Hartford that are working to improve nutrition, strengthen local food systems, and empower communities to move toward long-term food security. This year, the Food Security Awards will take place on Thursday, March 26th at the Downtown Branch of Hartford Public Library in The Hartford History Center. The event will begin at 5:00 pm with refreshments courtesy of The Kitchen at Billings Forge and a resource fair, followed by a presentation by best-selling cookbook author, Terry Walters, with the awards ceremony starting at 7:00 pm. What is the Hartford Advisory Commission on Food Policy? This year’s keynote speaker will be Terry Walters. Author of three best-selling cookbooks, EAT CLEAN LIVE WELL, CLEAN FOOD, and CLEAN START, Terry Walters is at the forefront of the clean eating lifestyle movement. She is dedicated to sharing her knowledge and passion to eat clean and live well. Terry is regularly featured on television and radio, in print and Internet media, and is the author of the popular blog Eat Clean Life Well. She serves as Advisor to the Board of Directors for Urban Oaks Organic Farm and as Director of Culinary Education for The Institute of Sustainable Nutrition. Learn more about Terry on her website: http://terrywalters.net. Donna as Executive Director of Charter Oak Cultural Center oversees the “Beat of the Street” program. Beat of the Street began in 2011. BOTS, its acronym, places large potted organic vegetables throughout the city of Hartford in 14 different locations and has a raised bed garden on its property on Charter Oak Avenue. Part of the program is that it hires members of the homeless community to help tend the pots. In addition, the vegetables are available for free to anyone in need. The decorated pots are decorated by volunteer artist in the community which adds a visual awareness for street pedestrians that hunger exists in our neighborhoods. Ultimately, these pots represent a caring a city and remind people to eat healthy. For more than 20 years, Dr. Ferris has participated in and led a research group from the University of Connecticut, Center for Public Health and Health Policy (CPHHP) that has focused on explaining, preventing and treating various food related conditions such as childhood obesity and iron deficiency anemia in underserved populations. She has led the Husky Programs team that provides direct nutrition education to community members in Hartford, as well as led her team on a project initiative centering on shaping the food environment to promote healthy food selection in mid-sized and larger grocery stores in Hartford. Dr. Ferris ‘ professional commitment to research and education supporting underserved populations in Hartford demonstrates her passion in creating change in Hartford’s food system and the prevention and treatment of food-related conditions. As a representative for End Hunger NE in the Greater Hartford area, Marie has done over five food packaging events in Hartford. In 2014 and 2015 over 100,000 packages were put together. These events included: Emanuel Lutheran Church Hartford to Hands on Hartford – 25,000 packages, Concordia Lutheran Manchester to MACC Shelter – 20,000 packages, Lutheran Church in Farmington – 20,000 packages, Farmington Valley American Muslim Center in Avon – 32,598, and upcoming on March 22 Emanuel Lutheran in Hartford. As Interim Director for Community Renewal Team’s Summer Meal Program, Jane has stepped up at a critical time. During the 2014 Summer Meals program in Hartford, Jane and her staff provided over 28,000 summer meals that contributed to an increase in number of Summer Meals in Hartford. Six areas of Hartford received Summer Meals in 2014. One of the largest providers was Hartford Public Schools, which provided 185,000 meals at summer schools and libraries. This was an increase of 13,000 meals since 2013. Before 2014, CRT’s summer meal program had limited activity in the City. Thanks to Jane’s leadership and staff execution, there was a reverse in the decreased participation from previous years all within several weeks. As farmer for Hartford Food System, Dan is responsible for growing a variety of vegetables during the summers and fall at multiple sites in Hartford. These organically grown vegetables were sold at two farmers markets in Hartford, distributed through the Grow Hartford CSA, and also donated to soup kitchens. Dan has a strong commitment to growing local food that is healthy and affordable and the impacts of his work is extensive. Darlene has been serving the community through the My Brother’s Keeper ministry for the past five years. My Brother’s Keeper provides warm meals to residents living in the North End of Hartford. Over 300 meals are served through this ministry each month. Darlene coordinates the preparation and serving of meals each month. Through My Brother’s Keeper, Darlene develops connections with community members and provides additional support to individuals and families outside the ministry. Darlene’s effectiveness in her community work comes from her passion for helping others and recognizes that any one of us could be in greater need tomorrow than we are today. Jessica is the Senior Director of Research and Strategy at Urban Alliance. Urban Alliance works towards improving food security for many Hartford residents through two initiatives, Beyond the Basics and Revitalize. The mission of Beyond the Basics is to help people in the Greater Hartford community meet their basic needs of food, clothing and housing and move towards greater self-sufficiency. Through this initiative Urban Alliance supports several basic needs ministries, including food pantries and soup kitchens in Hartford. The mission of Revitalize is to provide avenues for people in the Hartford community to achieve optimal physical health. Through the Revitalize Community Health Outreach, Urban Alliance has distributed thousands of outreach bags, containing information about local health resources and a coupon for fresh produce from Hartford’s farmers markets, to Hartford residents, resulting in $4,500 worth of food purchased from partnering farmers markets in 2014. Jessica also contributes to research projects, such as a recent community food survey of the Northeast neighborhood, to develop and inform these initiatives. Since 2001, HartBeat Ensemble has created provocative theater that gets community members thinking and talking about social issues. HartBeat’s signature model of playwriting includes community-based research that informs the creative process. Their most recent work on food justice issues has raised awareness about the issues surrounding food at a local and global level. HartBeat Ensemble has also raised awareness about food justice and food security through other creative efforts, including the two-week long “festival of food security” in early September called FeedCT, which included pop-up farm stands, a resource fair with community organizations working on food issues in the Hartford area, and a calendar of events highlighting different food and justice centered events during the festival. HartBeat Ensemble is dedicated to raising awareness around food security in Hartford. Their works have demonstrated their commitment to food security and their creative approach to getting the Hartford community talking about food issues. Hartford Food System has had a long history of contributing to providing healthy food to Hartford residents. Through various programs like Grow Hartford which produces organically grown vegetables for sale at farmers’ markets in Hartford and its Healthy Food Retailer Initiative, Hartford Food System has increased the amount of healthy food stocked and sold in Hartford’s small retailers. In addition, there has been a high number of youth involvement in farming, food justice issues, and learning about nutrition through its youth program also known as Grow Hartford youth program. Overall, Hartford Food System has a very long history of successful advocacy on food policy issues, urban farming, and other community focused programs which makes it unique in the City of Hartford. Since 1978, Hispanic Health Council has been committed to developing and providing a comprehensive approach to improving the health and social well-being of Latinos and other low-income city residents. HHC in collaboration with Hartford Food System this year developed the Hartford Mobile Market in order to address the lack of access to affordable and high quality produce in Hartford’s neighborhoods. The Hartford Mobile Market sells fresh fruits and vegetables from locally and regionally grown farms and brings them into underserved communities in the City. This collaboration between Hartford Food System and Hispanic Health Council has the potential to positively impact low-income residents of Hartford and regional farmers to support a more robust healthy food system and improve Hartford’s food security. Hartford School Garden Advisory Team is a team of people who are interested in Hartford public schools developing school gardens. The purpose of these gardens is to grow vegetables, help teach students about growing healthy food, how plants grow, and taking care of the environment. The Team provides hand-on help, classroom teaching, seeds, and guidance to make these gardens successful. Lincoln Financial Foundation has been a steadfast financial supporter to Hartford’s nonprofits like Hands on Hartford MANNA Community Pantry and Assistance & Advocacy Programs, providing $20,000 of support in the last three years. Their supports allows nonprofits like Hands on Hartford MANNA Community Pantry to provide fresh produce, bread, milk, and eggs to Hartford residents as well as provide health screening and educational workshops for their clients. Lincoln Financial Foundation’s support impacts approximately 3,300 Hartford residents. In 2013, they provided thirteen grants in the human services area totaling $172,500. Comstock, Ferre & Co. offers a variety of vegetable, flower, and herb seeds for sale, including many heirloom organic, non-GMO seeds through Baker Creek Heirloom Seed Co. The Baker Creek Seed catalogue provides a beautiful pictorial display of many of these amazing seeds that are grown around the world with a description of their deep cultural history. Baker Creek seeds help connect gardeners with the history behind their seeds. Comstock generously donates seeds for use by community gardeners in Hartford, for school gardens, and urban farming by Hartford Food System. These seeds produce an immeasurable amount of healthy vegetables, flowers, and herbs that are consumed by Hartford residents. New England Seed’s goal is to create a line of high quality, chemical-free seed products, and provide them at a reasonable price to consumers. Every year, NE Seed makes a strong effort to donate leftover seeds to local non-profits like Hartford Food System, Food Corps, Knox Parks, and the Family Day Foundation. NE Seeds has sold seeds that have helped grow thousands of pounds of produce every year that is distributed to food pantries and farmers markets. New England Seed’s donations have positively affect thousands of Hartford residents every year by increasing the amount of fresh, healthy produce grown in our city. Year after year, New England Seeds has proven how dedicated they are to improving Hartford’s food security. From the Ground UP is a group of seven High School students working to tackle food justice issues within their community. After completing many successful projects in their immediate community, they branched out to Hartford. From the Ground UP, through the legal process, have successfully worked with both Knox Parks and Hartford Housing Authority in obtaining the land for a Community Garden in order to provide a way to not only get healthy food to the residents of the North End of Hartford, but also serve as an outdoor classroom for children and families. Kevon Johnson has been part of Grow Hartford for almost two years. As a dedicated member of Grow Hartford, Kevon has rose into the role of youth leader as an advocate for food justice in Hartford. He successfully leads the group through team building activities, social justice activities and facilitated and debriefed discussions. In addition to advocating for food justice in Hartford, Kevon has dedicated countless hours of farming on the Grow Hartford urban farm. Kevon has not only contributed to Community Food Security in Hartford by planting, growing, and harvesting vegetables in one of Hartford’s urban farms, but also by educating his peers during programming hours and the Hartford community through presentations and workshops. Above anything else, Kevon recognizes the injustice his community experiences through our food system and is passionately dedicated to ending it. Congratulations to all of this year’s nominees, and thank you to everybody who submitted nominations! We hope to see you at the Food Security Awards event on Thursday, March 26 from 5-7:30pm at the Hartford History Center in the Hartford Public Library.